When people consider alcoholic drinks from apples, we immediately think of Cider. 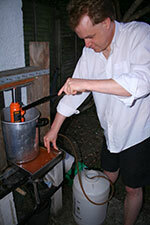 However, it is often more sensible to make apple wine. In the UK apples are often too sharp to make a decent cider, unless it is sweet, but converting apples into apple wine makes a delightful and flexible table wine. Unlike cider, apple wine will keep for years. Many recipes for homemade homebrew apple wine are based around chopping the apples, making a mash, and fermenting on the mash, and then straining later. Whilst this makes a very nice apple wine, it is not terribly scalable. Do you fancy straining 10 gallons of wine? No. Use a press! I make ten to fifteen gallons of apple wine each year. The apples are collected from a local friends house who has a number of apple trees. When collecting apples, it is important to taste the apples first, and make sure you choose the less tart ones. At the same time you need to make sure you get a good mixture of apples. Malic acid is the principle acid in apples, and if you use exclusively sharp acidic apples, you will have trouble reducing the apple wine to a drinkable acidity without adding sweetening sugar. Also make sure you exclude any mouldy or insect eaten apples - these will taint the other apples in a few hours. Once you have collected your apples, it is important to processes them as soon as possible - leaving them in a sack for a week will result in apple compost. The best time to pick the apples depends on the weather. LEave it too late, and too many apples fall to the ground and are wasted. Pick too early and the apples contain high levels of acid. I find the best time is the first week of september, but I live on the south coast of the UK, so it will vary with your region. Once you have collected your apples, the first stage is to crush the apples. You cannot put whole apples into a fruit press. The apple must first be pulped before being pressed. You can use an electric grater attachment for your food processor, but it is rather slow. 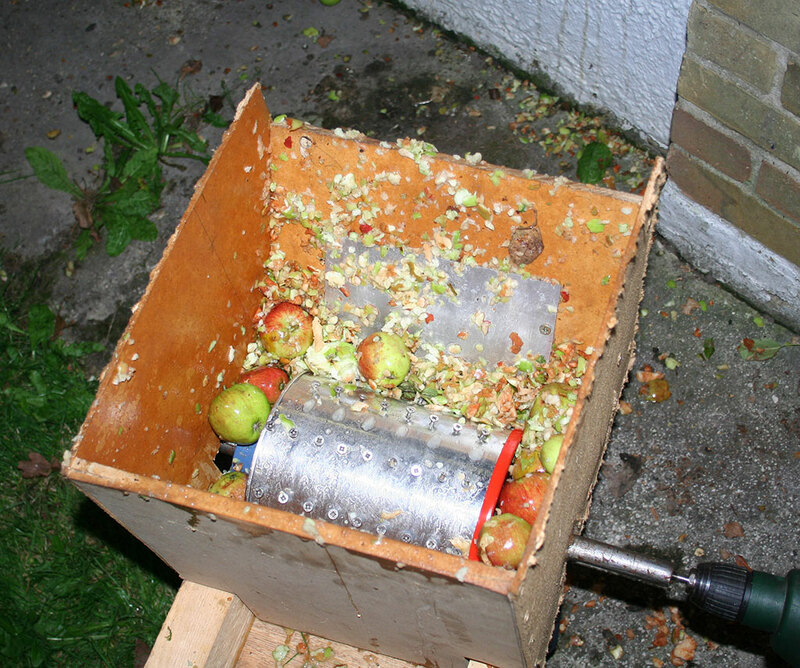 The best way of pulping apples is to use a device called an apple scratter. 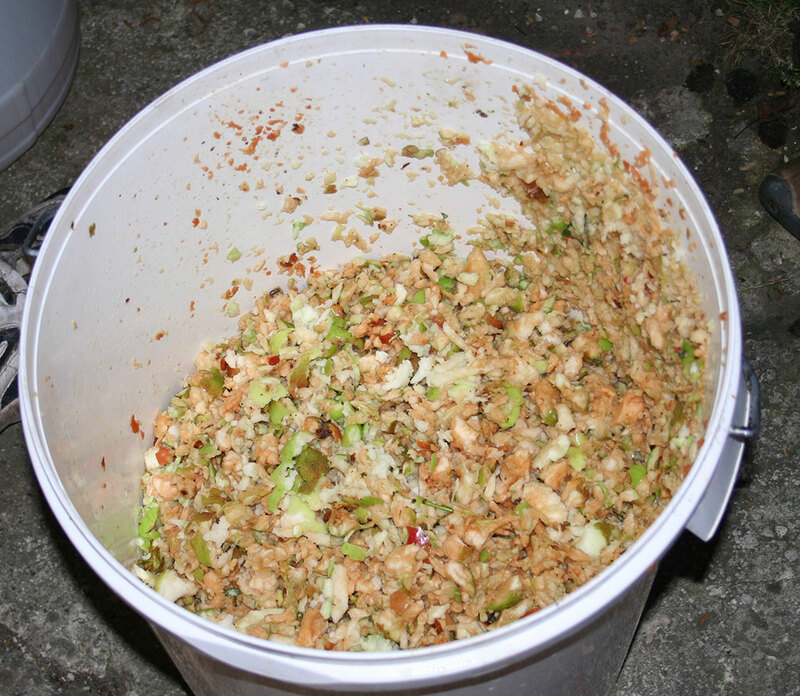 The mashes the apples with a roller and results and a sort of shredded pulp that you can put into your fruit press. The key is to crush the apples and break up the cell structure to let the press get the juice out more easily. You can buy these machines, but they are quite expensive, so it is better to make one. I have a homemade homebrew apple scratter constructed from some scrap wood and concrete. Cost about £20. Now you can press the apple pulp in your fruit press. Again, these are expensive to buy, but cheap to make. I use a old pressure cooker (free), a wooden frame (free scrap wood) and a car bottle jack (which I had anyway) to press my fruit. Generally a full bucket (2 gallon) of apples makes about 1/2 gallon of juice. With an evening of hard work, I can collect, crush and press enough apples to make 6 gallons of juice, which is easily good for 10 gallons of apple wine. Next you have to choose what level of body you want in your wine. I normally use 3 gallons of apple juice, with enough water and sugar to make the final volume about six gallons and the gravity about 1085. Included in this is a 1 litre can of grape concentrate. Apples are acidic enough without having to add extra acid. If you want a lighter wine, reduce the amount of apple juice and add more water. I often add some aromatic ingredients to the apple wine such as a spoon of dried elderflowers and orange blossom. I will usually add some oak chips as well, as this works very well with apple wine. Once you have a fermenter full of apple/water juice at the 1085 gravity, add the usual nutrients and then add the yeast. The yeast for apple wine is very important! Gervin wine yeast varietal D S. cerevisiae (bayanus) German Strain (purple on white packet) is the best yeast to use for apple wine. Not only does this ferment well at lower temperatures but it reduces the level of malic acid in the wine as part of the fermentation process. Apple wine can have too much acid, and using this malic acid eating yeast will help reduce the acidity. Once the fermentation is complete, the wine needs to be matured. Apple juice contains a high level of acid and tannin, and a year of maturing will produce a nicely balanced wine. Very young apple wine can be horrible stuff, but that year of maturing is vital. Two year old apple wine is a delight, and it doesn't keep for much longer than that! That Gervin varietal D S. cerevisiae (bayanus) German Strain yeast is such wonderful stuff that you may find it drops the level of the malic acid too low! If you make the wine very dry with a final gravity of about 990, then it might, after 6 months of bulk maturing, taste a little flabby because of the low acid. At this point you need to carefully add some winemaking acid mix to raise the acidity a touch to restore the proper balance. Always bottle wine a tiny bit on tart side, because the acidity is apt to fall during bottle maturing as the alcohol and acids combine to form esters. Alternatively, blend it with some more acidic wine to produce a balanced result.